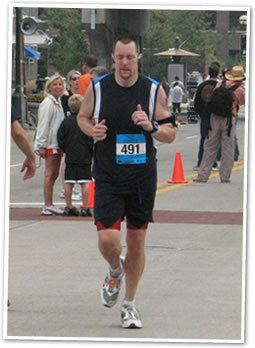 ​The goal of running a sub 4 hour marathon still drives my running. I also wanted to prove I had learned the lessons from my last marathon. I trained for 4 months. During my training I averaged 36 miles per week. For people thinking about running a marathon I would say "keep stretching to prevent injuries, take hard and easy days, and cross-train to build complementary muscle groups". I said my good byes to my family and set out to find my pacing group 4:00 marathon led by Sam, who I later discovered was fantastic. There were a number of first timers running with me, like Chuck, Sarah, and Kate, and some trying to qualify for Boston like Paula. The race went off without a hitch, and it took me about 1:30 to get out of the gate after the gun. Miles 1-5: My goal for the first 5 miles as my game plan post said was to run 9:15 and prevent over-doing it right away. I can't say I necessarily met that goal as my average time was 8:53, but I did intentionally take it slow. I stuck right with my pace guy who should have been doing 9:09. The hill in mile 2-3 really was an easy hill. I run a steeper hill almost daily by my house, and this one felt easy. The highlight of this period was meeting two great running partners to run with Kate and Sarah. They took my mind off the running and were of the same mindset as me -- enjoy the race and the scenery. I love running with a partner, and these ladies certainly made running easy. Miles 6-10: These miles were also easy. The 9:18 mile was likely due to the steep bridge on-ramp and trying to slow down to let the pace group catch up with me. I got to see Laura and Tasha around mile 7 and got a quick drink of some electrolytes. They were a welcome sight, but overall the running was easy at this point. I was feeling great and there wasn't much doubt in my mind about getting a great time today. Miles 11-15: These are the middle miles of the marathon. You are far enough in that you know what kind of day it is. The weather was fantastic with it being cloudy, bit humid with a great little breeze to cool you off. I had a great conversation with a man from Guatemala, who was running his first marathon, and we discussed how running is not very prevalent in Guatemala due to the climate and the geography of the country. I love the unexpected conversations you get sometimes -- Laura called me a running social butterfly, but I'll take it as a complement. Mile 11 and 13 as the game plan post alluded was going to be my second visit with Laura and electrolyte drink. Unfortunately, that did not happen. I wouldn't find out until later, but Laura got lost between the half marathon and the full marathon bridge exits. She only made it to the correct stop by the time the 4:15 pace group went by. I had my own "Streetcar Named Desire" moment as I crossed the Blues Brother's statues the second time not seeing her as I called out, "LAURA. LAURA. LAURA!!!" with no response. As I crossed into Arsenal Island, the running was getting tougher. I am not sure it was entirely the lack of electrolytes and disappointment at not seeing my family, but I knew it was going to be a longer day. It was at this point I had turned on my iPod for the first time. No Arsenal Island guards shot me or harassed me, and it made the running doable. I was still 500 feet according to my Garmin ahead of pace at this point. I could feel the running getting more tough, but the sponge to the head cooled me down. Miles 16-20: As you can tell, mile 17 is where things started to get to me. I stopped to take a biobreak, which some other guy cut right in front of me forcing me to wait longer. I lost my pace group, and I just couldn't catch back up with them. It had also been 10 miles since my last electrolyte drink and a slight head-ache was coming on. Mile 18 was indeed a very gloomy mile, and I wasn't quite sure I was going make it. I however met a running angel in the words of Betsy's post. I was down and walking too much. I won't say he made everything better, but this other runner's simple act of kindness and concern pulled me part way out of the funk. I did a mile run then walk system. My head still hurt, but I was going to at least make it to mile 20 and see my family again. As I mentioned in my race review, this section is just really serene in a place where I needed more fan support. The picture at the beginning of this story is me at mile 20 just before seeing Laura again. The smile is definitely gone, and all that is left is determination to do a few more steps. Time Distance Split time Elev. chg. Miles 21-26.2: I was about 5 minutes off goal pace at this time. I had to stop to get something to drink -- unfortunately the bottle was too empty. I drained it right away. If I thought more, I might have taken some Ibuprofen and more Sudafed for the drippy nose, but of course I didn't. Tasha ran about 2 or 3 blocks with me before sending me off. These were some tough miles -- tough because I knew my goal was shot, tough because I saw the 4:15 people pass me by, tough because I was hard on myself. I forced myself to run for half mile stretches, then third mile stretches, and then to the bend in the road. The wheels had definitely fallen off during this stretch. I did see Betsy and my running buddy of mile 18 help during this section running the opposite way. Seeing them caused me to muster up just a bit more to complete for this final stretch. I have said in the past anyone can run 2 miles, but that was not me during this stretch. At the end, I finally recovered slightly to realize if I didn't speed up I wasn't going to beat 4:20. I sprinted down River Drive. I saw Tasha wanting to help out, and I just pointed that way towards the finish line. She got the clue, and started running next to me. I misjudged the finish line and realized it was still aways off. Having Tasha running beside me on the sidewalk kept me going. I made it the final quarter mile and finished in 4:20:35. It was not quite sub 4 I had hoped for, but it is over 14 minute PR from my previous marathon. As I crossed the finish line, I immediately had to stop running. I bent over, and that sent race volunteers to help out. I was very glad to be done and fortunately for all involved kept all my cookies in place. I sat down on the chairs near the chip retrieval volunteers, and settled everything down. I stayed to ensure my racing friends completed and congratulated those that I saw. I was not in much shape myself for walking around and pretty much sat and vegetated at that point. Two of my friends or race angels -- the guy from Guatemala and the blessing of Mile 18 -- stopped over to say hey and how did you do. It is amazing the connection that can be built just in that brief time span. Once I felt ready to walk -- shoe-less due to race blisters -- we made our way back to the car and to the hotel for the late checkout. I took a quick shower and discovered I WAY underused the Vaseline on a stick or the lost body glide. We made our way back to Polk City as I slept on the way. My recovery wasn't too bad. I took a week off from running and then slowly eased back into running. What self-respecting running geek would be caught without a GPS watch. I absolutely relied on this watch to maintain the right pace during the race and as motivation to keep running in the later miles. Hold it - don't take bio-breaks if you absolutely don't need to. I could have held off until later, and I would have likely stayed with my group until at least mile 20 -- saving 6 minutes. More race fore-planning -- either run with a fuel belt or devote the time to ensure the family support knows the route backwards and forwards. The fault is mine alone for not getting this right. Running better when alone - I always run with a group, and stink running alone. Perhaps I need more 10+ mile runs by myself to simulate the loneliness of race day. Counting on race angels is bad strategy. and I finished in 4:20:35.